I just got home from a road trip, will be leaving for another in two days, then back home again, then off for a long weekend for a wedding two states away. And that's just in one month's time. So of course I wanted an easy to pack wardrobe that resists wrinkling after I've smashed it in my little suitcase. I bought this gorgeous tropical print from Fabric Mart some weeks back. It's an ITY, a fabric I've often shied away from. They always seem to have a zillion options in stock. But ITY comes in a soo many awesome colors and prints, drape so well on my figure and sew up really easily for me between my serger and regular sewing machine. I'm a sucker for a teal and red combo print, it just pops! 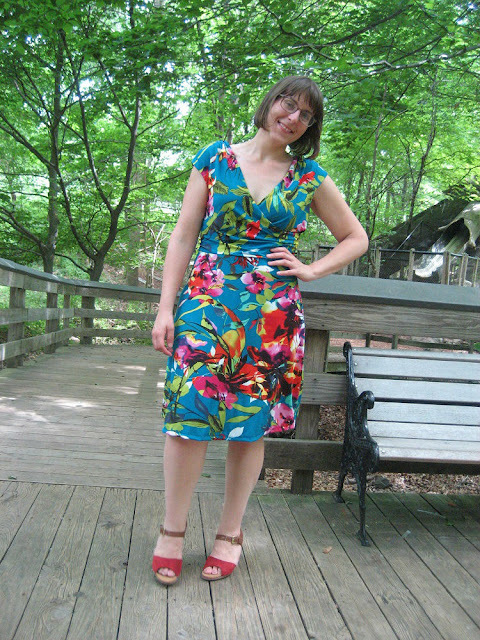 I used McCall's 6713, View A for my pattern. It's a simple little a-line dress with a deep v-neck that's wildly flattering on pear shaped figure. If you notice on the pattern there is a flounce, I just excluded that because I didn't have quite enough yardage on hand for it. I really like that the bodice is fully lined, it allows the outer main fabric to not cling to the skin, but to drape lightly with all the shirring. I cut a size 16 bodice and graded out to about an 18 at my full hip. I added 1 1/4" length to the bodice and 1" to the length of the skirt. This pattern seems to run a tad shorter than others hence the addition of that extra little 1/4" more on top. I usually just add 1" for me. The tissue just looked short, plus after reading reviews online, folks said they found it to run shorter as well. After sewing it up, I tried it on and I needed a MAJOR swayback adjustment and needed to remove about 2" from the back waist... it as a baggy mess. So I just went in and zipped off a fish-eye dart at the back waist- which lifted up the back skirt to an even hem. I then had to put in two vertical darts starting mid-back to the high hip... you can't even see them the print is so busy. At the sewing machine and serger, this took me maybe three hours to sew up. I can't find a fun knit dress that fits me this well and has an awesome loud print like this in any store in that amount of time. ITY knit is a polyester material. 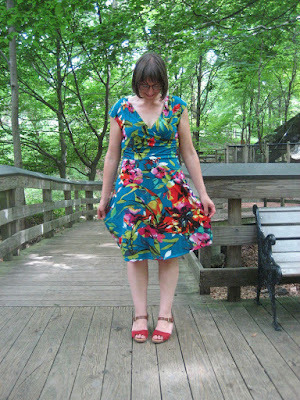 I wore this for my photos today on a long hot, humid walk through the zoo, temps in the high 80s, low 90s in the sun. I didn't feel like I was more hot than if I wore a different sort of material... likely because the fit is pretty breezy. Now off to pack for the next road trip... again. Oh wow, this is GORGEOUS!!! I love this print on you and the fit it great. 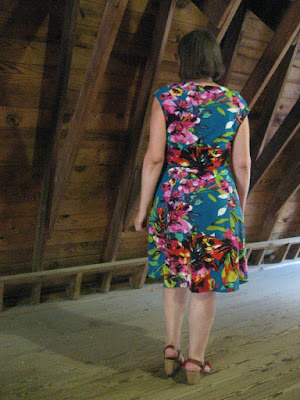 Kathy, I just LOVE this on you, it fits so well and the colors suit you! Gorgeous. I agree on ITY and packability--it is perfection for travel! Thanks Dina! It was crazy how non-wrinkly it was all week long when I went form hotel to hotel to family's houses and back again. I need like a dozen more! Fantastic look for you, Kathy! Great job fitting this perfectly. I agree with Dina and Ann, this looks fantastic on you! The colors! So very pretty! 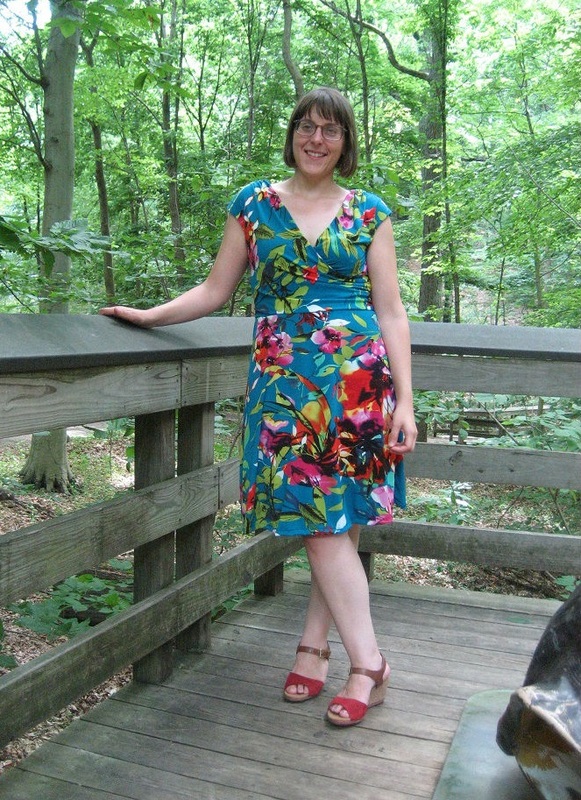 Such a pretty dress with a beautiful print. The trees in the background were the perfect backdrop. Thank you so much Jenese !!! Wow! Thank you so much Abigail!!! !